Thoroughbred racing is one of the most popular forms of horse racing today. Millions of dollars go into this horse race betting. Throughbred racing is considered one of the grandest sports in history. Thoroughbred racing and horse race betting has a rich history that only boosts its popularity. Betting on these races is a source of great fun and excitement for many people and when you pick the right horses can boost your bank account. Many racetracks in the US have great facilities to make a full family outing of a day at the track with refreshments and a beautiful infield where many families will picnic while watching the horses run. Thoroughbreds are prized worldwide for their speed, agility, spirit and intelligence. They are excellent competition horses and while are most famous for flat racing like the Kentucky Derby, they excel in a number of different styles. These horses are one of the most popular breeds in racing and jumping. They have been considered the standard in equine excellence. They are so highly valued that their lineage has been carefully documented, and purebred horses can trace back their lineage to the first three official sires. When you mention horse racing in common company, the first thing most people think of is thoroughbred flat racing. These flat races are commonly 1 – ½ miles long. They can be run on dirt, grass (turf) or a synthetic racing surface. 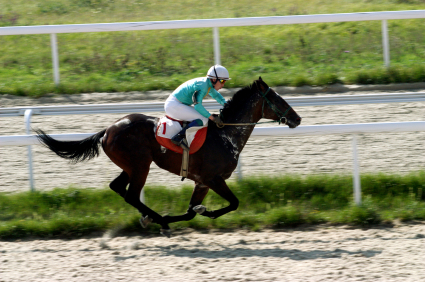 Flat races are run worldwide, and the most famous of these races are considered to be very prestigious events. Men and women will show up in their fanciest garb and the women will wear large and sometimes fanciful hats. Thoroughbreds are also favored for steeplechase races. Steeplechase races are longer than typical flat races. They are between 2 and 4 miles, the object of this race is for the horse and rider to clear different obstacles while running a race side by side to their opponents. Thoroughbreds are prized in this sport because of their long legs and agility. Thoroughbred racing was at one time considered the Sport of Kings. The horses were owned by nobility, who would race them against each other in match races for private wagers. As the sport’s popularity grew, spectators love watching the horses compete. The US Triple Crown is one of the most well known trifecta of racing world wide. This trio consists of the Kentucky Derby, the Preakness Stakes, and the Belmont Stakes. These three races have been featured in a number of Hollywood movies. There are also quite a few movies surrounding the training of a throughbred race horse. While they may romanticize the throughbred racing world, these movies only help to increase the popularity of throughbred horse racing. Thoroughbred racing already boasts some of the biggest purses in racing. The great popularity in these races has made horse race betting a very lucrative business, and a big race such as the Belmont Stakes with a million dollar purse can have hundreds of thousands wagered on the outcome. A bettor who is good at picking winners can make a great profit with strategic bets. With flat racing so popular, there are no shortage of places a player can place bets. From sportsbooks, casinos, racetracks and even online betting sites, there’s an option for everyone.